Mary Elizabeth Dawson was born May 30, 1937 in Chariton, Iowa to Ardery Johnson and Juanita Darlene (Repp) Cooper. 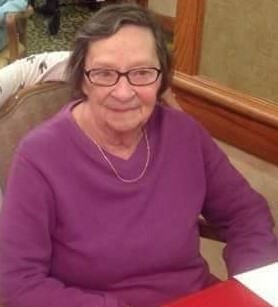 She passed away on November 22, 2018 in Indianola, Iowa at the age of 81 years. Mary attended the Chariton area schools and graduated from the Chariton High School with the Class of 1955. After high school, Mary enlisted in the US Army, where she served her country for three years and was honorably discharged on October 3, 1958. She was united in marriage to Dean Dawson on January 30, 1962 and together raised their four children, Elizabeth, Debbie, Rick and Dean, Jr. in Chariton, Iowa. Mary was preceded in death by her parents; a younger sister; and her husband, Dean Dawson on February 4, 1992. She is survived by her children, Elizabeth (Doug Crawford) O’Brien of Texas, Debbie Evans (Steve Davis) of Chariton, IA, Rick (Jennie) Dawson of Indianola, IA, and Dean (Jackie Miller) Dawson, Jr. of Mingo, IA; her brother, Gary (Nancy) Cooper of Bella Vista, AR; her grandchildren, Derrick, Becky, John, Sheena, Darrah, Conner and several great grandchildren; her cousin, JoAnne Schrader of Chariton, IA; extended family and dear friends. Memorials may be directed to the Chariton Public Library.